Home	/ Story of SVYM / (40) Maari, my little heroine! (40) Maari, my little heroine! During my recent two week break, I was at Saragur and Poshini asked me if I would be interested in interacting with some of the tribal women from different tribal Self Help Groups that she was working with. I saw in this an opportunity to reconnect with and also recharge some of my grass root emotions. It was wonderful to meet all these women who had gone to great lengths to bring about a quiet revolution in their respective tribal colonies. They are the unsung heroines trying to usher-in change without disrupting the existing social and cultural norms. Maari, the young woman from Hoshalli tribal colony was overjoyed on seeing me and was very eloquent in telling me about her struggles in motivating the other Jenukuruba women to join her in this micro-credit revolution. Looking at her, I was transported back in time to 1990, when I first met her as a shy and reticent 7-year old. I found her loitering around in her tribal colony where we had just built two small rooms to serve as our formal school. It took some persuasion to motivate this young child to come to the school. But once in, she took to the school like a fish takes to water. I still remember many days when she would come and sit in my office and ramble on about her self, her family, her siblings and everything she thought I would be interested in. She was a child who could captivate anyone with her laughter and sweet talk. The school soon grew and Mamatha had joined us and had taken over the reins of the school. Maari worked her magic on Mamatha and soon she was her favourite too. It must have been 1994 or 95 and Maari must have been either in the 5th or 6th standard. 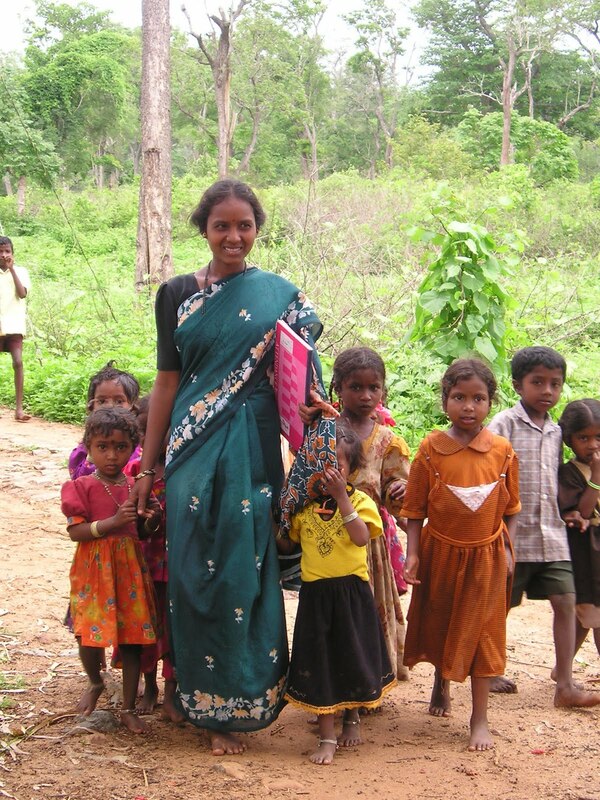 Mamatha had not found her in the school for 3-4 days and was quite disturbed. She told me that it was unlike Maari to be absent for so long. Both of us decided that we would visit her hut the next day and meet with her family and try to understand why Maari was absenting from school. The next day we visited her house and did not find Maari anywhere outside. Her mother met Mamatha and whispered something to her. Mamatha then came to me and told me that Maari had attained menarche and that her parents had decided that she would no longer go to school. I was dismayed and angry. How could they simply crush a flower when it is still a bud? Those were the days when I had very little patience with these traditional practices, which I thought were detrimental to the tribals. The Jenukurubas are a very closed community and a tribe with more than 50,000 years of anthropological history. Their traditional practice when a girl attained menarche was to put her in a small thatched enclosure which had one small opening to serve as a door and a window. The girl would be kept inside this hut for as long as the parents and the chieftain felt that it was appropriate. Food would be given through this opening and the child could come out only to relieve herself. And that too, in the cover of darkness and without any male seeing her. This period could be as little as few days to as much as few months. When the parents felt that the girl was ready, she would be shown a man and she would then have to live with him thereafter. Thankfully, this practice is now on the wane. Mamatha was livid and wanted me to use my standing with this community to break this tradition and take Maari back to school. I was torn between what I felt was the right thing to do and my respect for Hostel Masthi, the elderly Jenukuruba chieftain. After some discussion, Mamatha made an offer to the parents, the chieftain and the other tribals present there. She told that we would ask Maari what she liked to do and all agreed that her decision would be respected. What a joy it was when Maari simply announced from inside the hut that she wanted to return to the school, broke through the thatch and held Mamatha’s hands and said “come madam, let us go back to school”! Here was the same Maari, showing the same degree of self-confidence and determined optimism as she explained to me her plans for herself, for her family and her community. Maari also broke the tradition by being one of the first Jenukuruba women to marry outside her community and set up her family in Hosahalli itself. Previous Article What does the National Youth Day mean to us?